The eighth edition of this best selling text continues to help senior under graduate students in engineering, business, and statistics-as well as working practitioners-to design and analyse experiments for improving the quality, efficiency and performance of working systems. Continuing to place a strong focus on the use of the computer, this edition includes software examples taken from the four most dominant programs in the field: Design-Expert, Minitab, JMP, and SAS. Douglas C. Montgomery, Regents' Professor of Industrial Engineering and Statistics at Arizona State University, received his B.S., M.S., and Ph.D. degrees from Virginia Polytechnic Institute, all in engineering. From 1969 to 1984, he was a faculty member of the School of Industrial & Systems Engineering at the Georgia Institute of Technology; from 1984 to 1988, he was at the University of Washington, where he held the John M. Fluke Distinguished chair of Manufacturing Engineering, was Professor of Mechanical Engineering, and Director of the Program in industrial Engineering. He has authored and coauthored many technical papers as well as twelve other books. Dr. Montgomery is a Stewart Medalist of the American Society for Quality, and has also received the Brumbaugh Award, the William G. Hunter Award, and the Shewell Award(twice) from the ASQ. The residual maximum likelihood (REML) method is now emphasized throughout the book. 83 new homework problems (including in the areas of biochemistry and biotechnology). New material on nonregular fractions as alternatives to traditional minimum aberration fractions in 16 runs and analysis methods for those designs discussed and illustrated (Chapter 9). New material on constructing factorial and fractional factorial designs using an optimal design tool (Chapter 9). New topics and problems in the area of response surface, including designs that combine screening and optimization and use of optimal designs (Chapter 11). New topics in nested and split-plot design, including the use of REML in the analysis (Chapter 14). Includes software examples taken from the four most dominant programs in the field: Design-Expert, Minitab, JMP, and SAS. Focuses on the connection between the experiment and the model that the experimenter can develop from the results of the experiment. 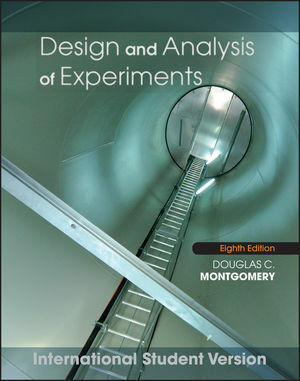 Stresses the importance of experimental design as a tool for engineers and scientists to use for product design and development as well as process development and improvement. The use of experimental design in developing products that are robust to environmental factors and other sources of variability is illustrated. The use of experimental design early in the product cycle can substantially reduce development lead time and cost, leading to processes and products that perform better in the field and have higher reliability than those developed using other approaches.